Spoiler Alert: The scent of clean laundry that you're used to may be caused by nasty chemicals -- what's the deal with that?! 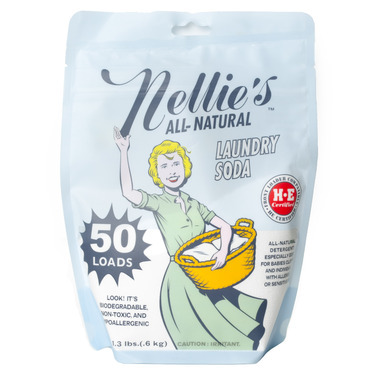 Luckily, you can discover the true smell of naturally clean clothes with Nellie's Laundry Soda! It's hypoallergenic and leaves your clothes soft, fresh, and residue free. It's also super-duper concentrated, so only one tablespoon per wash is needed, even in large loads! Directions: For best results use one tablespoon of Laundry Soda per LARGE wash load. Wash according to the specific instructions on your garments. Make sure to always test first on garments that may bleed or fade. Nellie's Laundry Soda dissolves quickly in cold or hot water. Ingredients: Sodium Silicate, Coconut oil based surfactants. I was having issues with eczema/rosacea and so I started switching all of my products over to more 'natural' options. Discovered this brand in the process, and I would recommend for those with sensitive skin! No residue on clothes, and no fragrance. I've been repurchasing for over a year. I'm so happy I found this laundry soap! It doesn't it does not irritate my daughter's sensitive skin and the clothes come out with clean with no odour just a lovely fresh 'clean laundry' scent. Great for my sons sensitive skin. Smells great and leaves no residue and cleans great. Highly recommend to everyone. Love it! Clothes are left feeling and smelling clean without any artificial fragrances. Also takes the smell put of cloth diapers! Will definitely purchase again! Love this soap - it's perfect for my sensitive skin. Even though this is a powder no residue is left behind. It is scent free and very gentle on sensitive skin. One scoop is all you need, making it very portable to take with you. I like it very much. I am a Nellie's convert! I like using a product that cleans my clothes and is safer for our skin. Both my children have sensitive skin and this washing soda is a perfect choice. I normally hang my clothes on the line but when I use the dryer I use my Nellie's wool dryer balls. I'm a very happy customer - thanks for stocking these great products Well.ca! I really like the fact that I am not putting nasty chemicals into the environment. And my clothes come out clean. I also like that I can use either hot or cold water. Let me start by saying my son has extremely sensitive skin and I have tried almost all 'natural' detergents out there and he has still had a reaction. But with Nellie's, not once! Not only is it super safe for his skin but it also cleans really well and I'm amazed every time how fantastic and fresh the clothes smell when there is no fragrance in this detergent. Make the change to Nellie's, you won't regret it! My order shipped quickly and this product works great for my cloth diapers. No scent and yet still leaves the diapers fresh. I have no complaints about this laundry soap. It cleans well even in cold water. I love that it doesn't take up space and it even comes with a scoop. This soap is a win! Worked really well on my bedsheets and was gentle on my clothes. My skin's sensitive, and I definitely felt the difference on the sheets overnight. However, it couldn't quite win the fight against my husband's armpits. I'm definitely going to keep using it on sheets and clothing that doesn't smell much though. I really like this product. I have tried several natural detergents and nothing really compares Nellies. It is also significantly cheaper. I've been stuck on using Nellie's for years and have nothing bad to say about it! No residue, very cost effective, and although it is unscented your clothes come out smelling fresh and clean. No scent and cleans like a dream! This one blew me away! No chalky residue and zero scent. Will be switching to this one permanently. We just recently switched to Nellie's. I bought it for use on cloth diapers, but we've switched over to using it for our regular laundry as well. I like that you only need a small amount of it per load, and it leaves our clothes soft enough that fabric softener isn't necessary. All our regular laundry and cloth diapers come out clean. Lasts quite a while and I'm really happy there's no yucky stuff in it! Great for washing cloth diapers. Have been using it since 2011 for CD with no complaints. I think that I will switch to Nellie's products because they are the most natural. I have tried many others but Nellie's are the best. It requires only small amount of product to have nicely clean clothes. This product is great. Not sure how well it whitens compared to others but I notice it really makes my clothes very soft out fo the dryer. So no need for fabric softener. Does a great job! Don't need to use a lot either. Gentle on skin. Purchased this to try on my cloth diapers. I had been using Rockin Green but wanted to try a more cost effective option. I have done about a half dozen diaper loads with Nellies and I must say I am pleased with the results so far. Will definitely order this product again. just switched to Nellies for my cloth diapers. I agree with other reviews- great bang for the buck! I may switch over to Nellie's for all of my laundry needs. Love all Nellie's products. This product performs well and agrees with my sensitive skin! Perfect for baby too! I have been using this product for years! It's the best bang for your buck when it comes to natural laundry care. Great for whites. Finally I can get them clean! But I do find it harsh on colours. We've been using Nellie's products for years and love them all. So glad we can buy it online at Well.ca now. This is my favourite laundry soap! I was very happy to see that Well sells it now.